Dennis Fano set the standard for boutique, factory-aged guitars that borrow from the past but have a strong identity of their own. Taking a Jazzmaster-style chassis, simplifying the controls and adding Gibson-style pickup and bridge options proved to be a hit – although Dennis himself has since moved on from the company that bears his name, Fano continues to make some of the most beautiful and playable offset guitars around. Check out our review of this guitar here. The late, great Bill Collings is primarily associated with instruments that have Gibson in their DNA, and the 360 LT takes an LP Special and fuses it with offset character to create something altogether different. With Collings’ typical set-neck and 24 7/8-inch scale-length construction, the addition of premium Mastery hardware and sleek body contours makes the 360 LT feel like a true hybrid, while its compact size is ideal for those who find the Jazzmaster’s body rather unwieldy. Based in Nashville, the aforementioned Dennis Fano and his small team are creating some of the world’s finest bolt-on boutique electrics. Dennis describes the Serus J as “the offset reimagined”, and with its angular horns and batwing pickguard, it certainly has an appealing ‘parallel universe’ vibe. Under the hood, things are even more unique, with reclaimed pine bodies, tempered maple necks, numerous custom options and stunning aged nitro finishes giving these guitars a vibe all of their own. There aren’t many electric guitars in Fender’s long history that didn’t catch on in the end, but the Starcaster is certainly one of the few that remains niche in its appeal. It’s the influence of Fender’s 1970s offset semi that makes this Bilt model a little different. 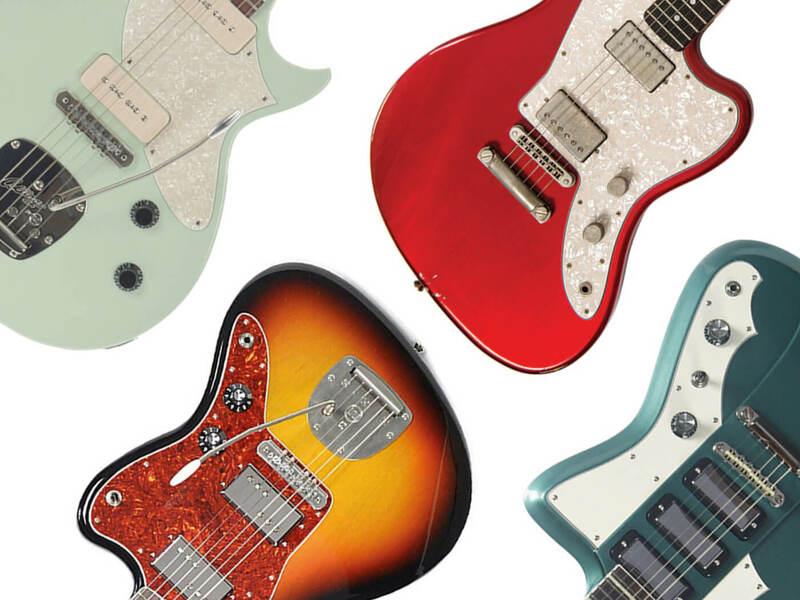 With twin humbuckers, semi-hollow construction and a sweeping two-step headstock, the SS Zaftig melds Starcaster, Jazzmaster and Jaguar features into a design that’s a whole lotta offset fun. Shelton Electric Instruments is based in Frederick, Maryland and makes some fine takes on classic instruments, not least this GalaxyFlite Blaster. Mastery hardware, stunning paintjobs and ageing are par for the course in this price range, but the ace up Shelton’s sleeve is the company’s clever reworking of the Jazzmaster’s quirky stock electronics to provide bass roll-off, series switching and a ‘sweet spot’ tone control. It’s that man Dennis Fano once again! The Rivolta brand is a collaboration between the offset maestro and Canada’s Eastwood Guitars, and has resulted in some wonderful and affordable retro-inspired instruments. The Mondata is no exception – the chambered mahogany body has a whiff of the Firebird about it, and that’s backed up by a trio of mini-humbuckers that offer a varied array of surprisingly hi-fi tones. Jennings Guitars produces some truly individual takes on the offset concept, but the Voyager Deluxe might be the most compelling of the lot. With its compact semi-hollow body and two-step headstock, the Voyager Deluxe borrows from a whole host of Fender models such as the Mustang, Jazzmaster and Starcaster, but stellar build and superb McNelly pickups make this a first-class platform for hip surf-rockers and indie noiseniks. James Trussart is a man who refuses to do things the easy way, and his take on the classic offset guitar is no exception. The Steelmaster features a chambered wooden body that’s topped with a recessed steel plate, and while it looks like absolutely nothing else on earth, it’s not just about aesthetics. The combination of chambered body and steel top delivers a killer tonality that’s suited to blues, raucous rock, and pretty much everything in between. The Gibson Firebird is often forgotten about when people talk about offsets, but Californian luthier Doug Kauer has gone out of his way to remind discerning guitarists of their charms. The Banshee’s inspiration is clear, but it’s been redesigned to make it a more road-ready instrument, with a redesigned body shape that offers added mass but improved access and balance, plus myriad pickup options. Rival Sons’ Scott Holiday is a huge fan. The brainchild of K-Line head honcho Chris Kroenlein, the Del Mar clearly nods towards Fullerton, but has plenty of its own identity, too. With a bolt-on alder body, maple neck, and rosewood ’board, the Strat-meets-Tele playability is no surprise, but the Klein Mustache Diamond Gold Foil pickups are a delight. The interesting switching options also offer a wealth of unconventional options for those looking for something a bit different. Tom Anderson is renowned for boutique electrics that usually appeal to more technically minded players, and the Raven is the respected luthier’s offset option that’s less a retro offset and more an offset-body Tom Anderson instrument. Instead of a Jazzmaster vibrato, a two-point Strat-style unit is preferred, while pickup options are more traditional in the shape of P-90s or humbuckers. If you like the offset look, but don’t fancy their eccentricities, this is all the guitar you could ever want. The original 1960s Television model was a suitably eccentric and unconventional offset for the eccentric and unconventional decade into which it was born. This modern interpretation has stripped away the complicated switching and weird pickups in favour of something a lot more universal – a twin-pickup semi-hollow offset with stunning quilted tops and a look that really sets you apart from the crowd. For more affordable offset guitars, check out our list of recommended models.